Our family has been making Boiled Cider since 1882. We grind and press apples on the farm's original screw press to make sweet cider and evaporate it in a wood-fired stainless steel evaporator. It is just concentrated cider with no sweeteners or preservatives added. One gallon of sweet cider is evaporated down to about one pint of Boiled Cider. Cooks use it in a number of recipes- from pies to applesauce to salad dressing to pork or chicken dishes. Take a look at our recipes for some ideas. Try it over yogurt, ice cream or pancakes. Try mixing it with hot water for a delicious hot drink. 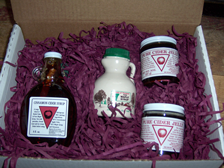 Cider Syrup is our own special mixture of Boiled Cider and Maple Syrup. It has the apple flavor of concentrated cider but is not as tart. Use it on French toast, pancakes and waffles, or as a delicious topping on ice cream or yogurt. Visit our recipes page. Cinnamon Cider Syrup is our own special mixture of Boiled Cider and Maple Syrup with a stick of cinnamon. It has the apple flavor of concentrated cider but is not as tart. Use it on French toast, pancakes and waffles, or as a delicious topping on ice cream or yogurt. Visit our recipes page. Our family has been making Cider Jelly since 1882. We grind and press apples on the farm's original screw press to make sweet cider and evaporate it in a wood-fired stainless steel evaporator to make Cider Jelly. Cider Jelly is concentrated about 9 to 1 and is just concentrated cider with nothing added, no preservatives or sweeteners. The cider from about 30 to 50 apples is concentrated in every pound of Cider Jelly. Use Cider Jelly with peanut butter for sandwiches, with cream cheese on bagels, on toast and doughnuts, or along with meat dishes and stews. Also, take a look at our recipes and picture gallery. Sugaring has been part of the Spring work on our farm since the early 1800's. 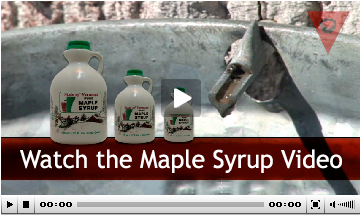 We make four grades of maple syrup: Vermont Fancy (light color and delicate maple flavor), Grade A Medium Amber (with a more intense maple flavor - the most popular grade), Grade A Dark Amber (slightly darker and stronger maple flavor), and Grade B (dark, strong flavor - good for cooking). We will substitute another grade if we are out of the one you specify unless you ask us not to. Visit our recipes page. Wood's Cider Mill has a wide variety of products available. Please click on the list of products to the left to view more information about them. Wood's Cider Mill now offers completely secure on-line ordering. If you are ready to start shopping please click here. If you are looking for cooking tips, please take a look at our recipes page. Our gift box includes two 8-oz. jars of Cider jelly, one 1/2 pint of cinnamon Cider Syrup, and one 1/2 pint of Maple Syrup packed in a gift box as shown above. We'll include a card with your greetings to the recipient.